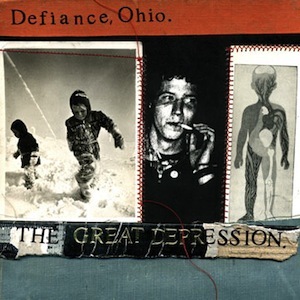 For the first few minutes of The Great Depression, Defiance, Ohio sounded a lot like fellow folk-punk band Andrew Jackson Jihad–a lot like. Acoustic guitars and preachy lyrics abounded, and I was scared that I was about to subject myself to a half hour of Andrew Jackson Jihad rip-offs. Fortunately, Defiance changed things up just a bit. It became clear that they focus on the musical aspects of their songs a bit more than AJJ, who tend to rely mainly on lyrics. For instance, before the traditional folk-punk-I-am-better-than-you lyrics kick in on This Feels Better, there’s a fairly interesting intro and hook to the song. Don’t get me wrong, I love the lyrics that come out of all of these folk-punk bands that this blog has gotten me into, Defiance, Ohio included. Sure, they can be really preachy, but the singers don’t act like they’re perfect. On The Great Depression opener Petty Problems, the singer (I think his name is Ryan) sings, “there are many kinds of problems, not all of them are like yours, or mine, but I forget that all the time.” This shows that he is aware that he’s not perfect either. Unfortunately, he comes off as condescending a lot of the time. Still, I’m not gonna lie, I really like this record. It’s nice hearing some female vocals in this band, as the other folk-punk that I’ve been exposed to so far sounds a lot like a musical sausage fest. While there’s nothing wrong with music with a high testosterone level, it’s always nice to have your ears graced by someone of the opposite gender every now and again.